Anyone who’s ever spent time working with grave markers can tell you that even a small headstone can weigh in excess of 100 pounds, so it makes sense that throughout time at least a few people have been the casualties of gravestone-related accidents. Take into account the popularity of large, ornate monuments and headstones during the Victorian period and the danger of being crushed by a toppling tombstone increases to an almost frightening level. Two-year old John Borovicks visited his father’s grave with his mother and three siblings on a regular basis. While everyone else prayed, John passed the time by climbing on a nearby lamb-shaped tombstone (probably marking the grave of a child). Despite his mother’s warning against frolicking around the stone lamb, he put his arms around it one last time one Sunday. The little lamb fell, landing on and crushing John’s skull. 18-year-old Yetta Berkowitz was visiting her twin sister’s grave, a grave that she’d mourned at for two years. The death of her twin had taken a heavy toll on Yetta’s emotional state, with many people thinking she would lose her mind. This version of Yetta’s death differs in some ways from the article transcribed on her Find a Grave memorial linked above. Here, a teary-eyed Yetta used the heavy monument to help her from her kneeling position, causing the poorly-erected base to collapse. The stone fell, hitting her head and physically pinning her to twin’s grave, which already had a mental hold on her. 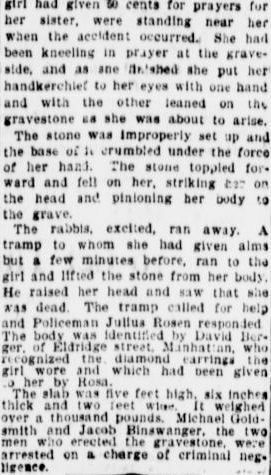 There were also rabbits nearby that she’d purchased in exchange for prayers, and the furry creatures scampered away in fear at the grave situation. A tramp came to the resuce and removed the broken monument, but she was already dead. She was identified by a pair of earrings that she’d been seen wearing. The two men who had set the monument were later arrested for criminal negligence. There wasn’t a memorial on Find a Grave in that cemetery for anyone born between 1884-1886 and who’d died around 1902. It’s possible that the grave marker that killed Yetta belonged to another relative instead of a twin. Or maybe the grave wasn’t entered into that site’s database. As if I wasn’t already overly cautious of my movements in graveyards, I’m going to be even more careful now with these grisly ghosts haunting around in my skull. I also need to warn anyone against trying to move or lift any stones unless you’re properly trained with the right equipment and permission. Also: please don’t let your children to treat the headstones like playground equipment, for they could end up like the Borovicks child. For more old news from old newspapers, stop by Misc. Tidings of Yore. It is unfortunate, but I can see how this kind of accident could happen. 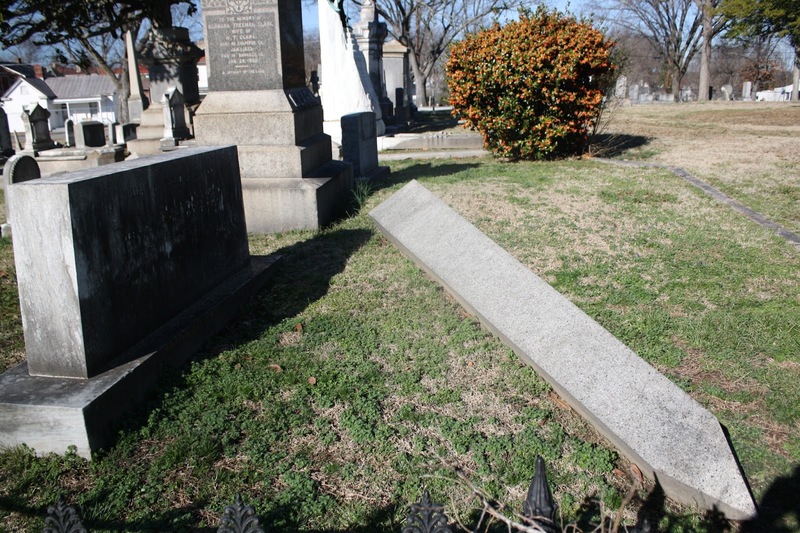 I've been in cemeteries where stones are leaning badly, and I always wonder if one of them could easily fall over, given the right conditions.